The latest software release along with an expansion of the global technical specialist team, highlight Malvern Instruments’ ongoing commitment to extending and supporting the application of NanoSight, a nanoparticle characterisation technology with unique capabilities. The Malvern NanoSight range enables the visualisation, sizing and counting of nanoparticles, exosomes, and protein aggregates, and is increasingly being used in biopharma and nanoparticle research. "Two years on from joining Malvern, the benefits of becoming part of a larger global business are clear. NanoSight customers are now benefiting directly from Malvern’s highly developed skills in making complex analytical techniques more accessible, through smart software and knowledgeable support from an extensive network of application specialists," comments Andrew Malloy, global nanometrics sales manager at Malvern Instruments. Malvern’s NanoSight range uses Nanoparticle Tracking Analysis (NTA), a particle-by-particle methodology to produce high-resolution results for particle size distribution and concentration. Visual validation provides users with additional confidence in their data. For many users, NTA is a relatively new analytical technique, though one with obvious value. "Nanoparticle researchers always respond well to the NanoSight systems and instantly see their potential but we recognise that the cutting-edge nature of the technology means it can require some expert support," said Mr Malloy. Recent additions to our technical specialist team in the US, offer doctorate level, application specific advice in key areas such as colloid science and exosomes. These experts are now helping customers across the globe to fully exploit the technology and gain new insight into their nano-scale systems." Gold standard support is a defining aspect of the Malvern Instruments offering. The new NanoSight technical specialists form part of a global network of support professionals. 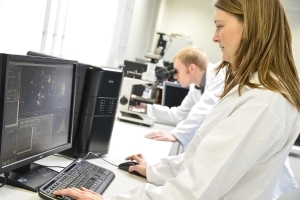 This network provides pre-sales and post-sales support across the entire Malvern portfolio, including techniques that provide complimentary and orthogonal information to NanoSight, in the characterisation of nanoparticles. These include the Zetasizer dynamic light scattering range for nanoparticle sizing. However, it’s not just people that offer customer support; embedded analytical intelligence is an increasingly important feature of Malvern instrumentation. "On a daily basis our new NTA software upgrade provides instant help to the analyst, at the benchtop," continues Mr Malloy. "It incorporates features that reduce user input and increase repeatability, enhancing inter-laboratory consistency in size and concentration measurements. Furthermore, it enables precise and accurate measurement at higher concentrations extending the applicability of the system." "NanoSight systems have an excellent reputation for delivering valuable insight in critical areas of nanoparticle research," concludes Mr Malloy. "Joining forces with Malvern is enabling us to drive the technology forward and extend its applicability to increasing numbers of customers." For more information, please contact Malvern.